I was inspired earlier this year, by Emily of The Daily Fashionista when she did a guest post here at the Citizen and shared her pledge to SHOP SECOND HAND. While we've already been great thrift shoppers already, I was inspired by Emily to create a pledge and honor it this year. I am teaming up with another thrifty shopper, the incredible Reva of Revas Rags 2 Roses, and we are all participating in this pledge, the SHOP SECOND HAND FIRST. I invite you all to join in. Feel free to sign up, just leave a comment and your email and I'll mail you the widget AND add your name to my sidebar for the month of April! a great idea..but ill pledge after six months!! When I can, I shop second hand, though if it's on sale, I shop "first" hand. I think price more than anything determines what I buy. For example, skirts that cost $3.50 from American Apparel new, yes, I'll buy it. My philosophy is pay as close to $10 as possible. 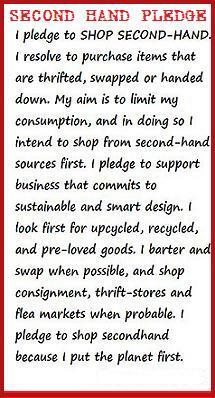 I love this pledge, and I know I find more interesting, often better made items at thrift stores and flea markets. I would suggest ebay and etsy to also satisfy the needs of those who are not in close proximity to thrift shops! They are open 24 hours a day 7 days a week too! Without knowing I've been doing this pledge for the last 2 years. The only time I had bought retail is when I need to get underwear! Ofelia, you are a woman after my own heart! i buy my lingerie and socks new, and TRY to get my clothing from a second-hand source. Second-hand is my FAVORTIE kind of shopping! Right now though I am a semi-finalist for Project Style at my local mall and have to spend $150 or less creating the ultimate outfit - from shops at the mall. Other than that contest - I promise to shop 2nd hand first!! Love those knee socks Bella!! Wish I could find something like those in my thrift store!!! I can definitely do this. I think I took the pledge twenty years ago! I've just started to embrace shopping second hand. It's SO MUCH MORE beneficial to everyone involved! I really, really want to do a swap, because I love watching everyone else doing it. But... I'm such an odd shape/size. It's really difficult! Thanks for your support my Bella Q! The Pallazo's are 29" waist, inseam 21", from waist to hem 35"
When I started scrolling down reading the pledge I was thinking, "I want to take the pledge!" Goodwill and thrift stores are my favorite way to shop. I do buy inexpensive things at Target, Family Dollar, etc., but I have been shopping more in thrift stores since starting my blog in January because I am committed to looking good for less and I very much like the idea that buying used is good for the planet! My email is thriftygirlvintage@hotmail.com. I would like to be a part of this! 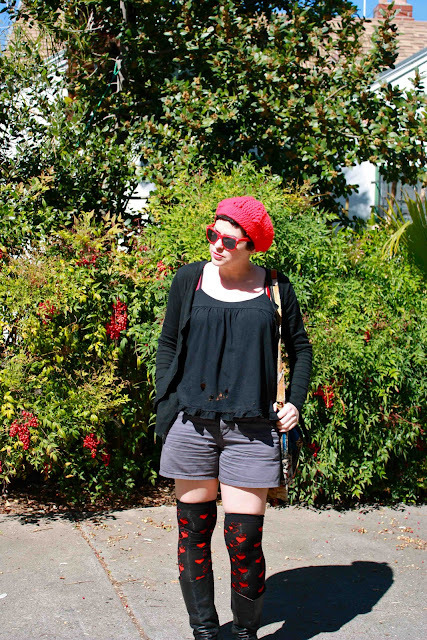 I love your accessories in this outfit - from the hat to the socks and shoes... it elevates the entire look to something so fun and funky! I hope to one day be able to do this. Unfortunately, there are not many great stores here in south florida. I pledged this 20 years ago and I'm still living it - so I am THRILLED to join this pledge - not just for April but for life! I have been shopping second hand first since the 70's, so this is my lifestyle. Sign me up! Thats a great sentiment. Whilst I buy a lot of my clothes vintage - and sell them too in my shop, I couldn't get everything vintage. I have stopped buying high street though and only shop designer so the purchases I do make are investments that will last, and I also believe in supporting the retail industry in this time of recession as keeping jobs is very important too. Hoorah!! Now this is something I can TOTALLY mesh with. The only time I get new clothing is when my Mom buys it and sends it to me. She can't help herself! I committed to only buying second hand as well! It's green, it's cheap, and it's so so so so fun!! I haven't bought anything brand-new since september, I did it as a "school year's resolution", but when may comes along, I'm gonna keep it up. Y'all are amazing! I really do need to hit up more second hand shops. I can say that I've been shopping my own closet a lot more this year! In this plastic walmart world that society has created, people want fast and cheap. I refuse to live like that! Not when I can thrift, not consume more, and save a lot of money. I pretty much do this already. :) It's more fun to supplement thrifted clothes with retail in my humble opinion. I love seeing other people getting into it! I love this and I am already doing it. I pledged to buy only second-hand for six months. Now I can take this pledge to carry on the habit for a lifetime. I just read about Alicia Silverstone in Vogue and she has taken this pledge as well. I can do this as well! It's my goal to make this a life-long change as I can't continue consuming the way I was before-it's too irrational, unsustainable and hurtful to the world around me. But I'd love to try. Where do I sign up?